Premier Concrete Finishing is second to none in concrete! We do beautiful, professional work that you’ll be proud of for many years to come. And, we have special expertise at creating stained and stamped work for the special touch that will takes your concrete to the next level. There are no short-cuts in concrete. There is the right way and the wrong way. Our experienced cement masons will set up the forms, ensuring they have the correct depth and pitch. 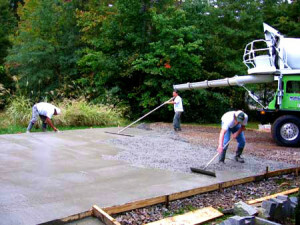 Then we’ll place the concrete either directly from the concrete wagon chute, concrete pump or, if need be, wheelbarrow. We spread the concrete using shovels and rakes, sometimes using a straightedge back and forth across the top of the forms to “screed,” or level, the freshly placed concrete. After leveling the concrete, we’ll smooth the surface using either a hand masonry trowel, a long handed “bull float” or powered floats. After the concrete has been leveled and floated, we press an edger between the forms and the concrete to give a chamfered edges that is less likely to chip. Finally, we cut expansion joints every twelve to fifteen feet to limit cracking. for a top concrete job at a competitive price.